Patricia Elliott is the author of nine novels for children and young adults. She was lucky enough to win the Fidler Award for her first, The Ice Boy, and since then has been short-listed for many other awards (however, to date, never again winning first prize!) 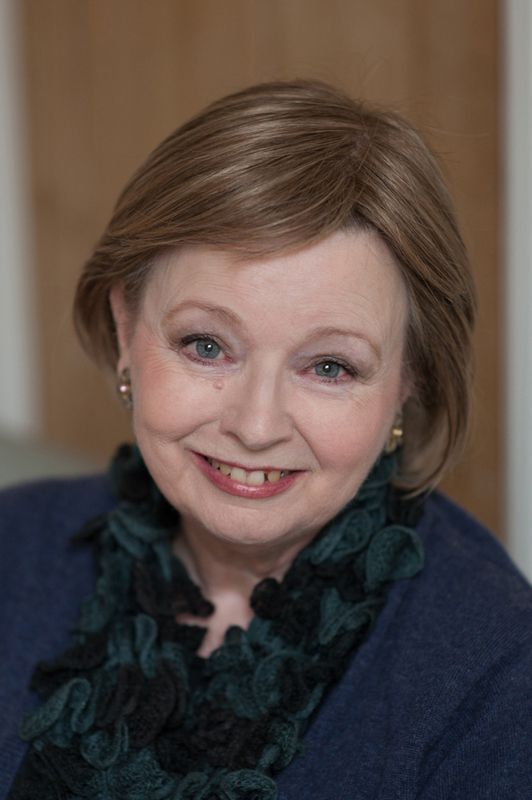 She has written in most genres – fantasy, historical, mystery - but settings are particularly important to her and Suffolk, where she lives, has featured in several of her novels, including her Victorian Gothic YA, The Devil in the Corner. Her last two novels were Middle Grade mysteries set in the Edwardian period and featuring twelve-year old would-be anthropologist, Connie Carew: The House of Eyes and The Ship of Spectres. She is currently writing a fantasy set on the Suffolk coast. Patricia Highsmith, whom Graham Greene called 'the poet of apprehension', is the protagonist of this clever, beautifully written novel, a successful combination of fact and fiction that is sometimes blackly comic yet always gripping. 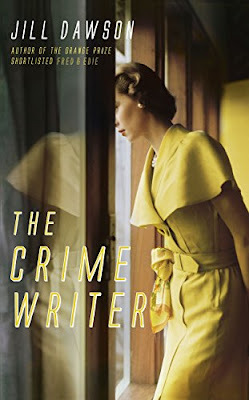 Jill Dawson has imagined Highsmith as the protagonist in her own murder story, and, like the characters in her novels, suffering the same feelings of guilt and terror after the act. I chose this novel to review because as a young teenager I was mesmerised by Patricia Highsmith's novels. Gloriously dark and menacing, with protagonists that seemed trapped in tragedies that had befallen them through one bad move that then led on, inexorably, to a chain of events they were almost helpless to avoid and yet, in a strange, inexplicable way, encouraged, as if they were playing a mad game, struck a resonance with me. At that age I had decided you could not escape Fate. It lay in wait for you and probably not in a good way, but it was fun to tempt it and see what happened. The Crime Writer is set in Suffolk, where I live now, not far from the village of Earl Soham where Patricia Highsmith, then in her early forties, came for a period in 1964. She also walked the streets of Aldeburgh, which I know well, with her close friend Ronald Blythe (author of the acclaimed Akenfield), and her irritable ghost roams still, I sense, brushing past the holiday crowds and up to the lonely, squat presence of the Martello tower brooding over the cold North Sea, where this novel ends. In Earl Soham Pat believed she would find the peace to work on both her new novel and a commissioned non-fiction book on suspense writing. The village was also within relatively easy reach of London and her lover, Sam, the unhappily married wife of the repulsive (to Pat) Gerald. Beautiful Sam, tall, poised, elegant, would visit her for romantic weekends when they would celebrate their secret love in complete privacy. But in The Crime Writer things do not go as Pat hopes. Hurried calls in the chilly phone box opposite her dank little cottage do not bring Sam as often as Pat desires. Always paranoid about being stalked she becomes convinced someone is following her, perhaps the same person who sends her letters that she leaves unopened. Hallucinations of a grotesque little man and the darting shadow of a mouse haunt her, as well as memories of her troubled, sometimes abusive, childhood. A heavy drinker and smoker, socially awkward, spiky, Pat is a passionate collector of snails, who likes to observe them mating on her window sill (and, indeed, shares some of the creatures' characteristics). Alone, she luxuriates in dark imaginings of committing murder. Those she knows - unloved, even loved - are the victims in her fantasies. Only her dear friend Ronnie (Blythe), always equable and kind, who does not judge her, can lift Pat's moods, though his 'sense of glowing health and cheer' can be exasperating. Jill Dawson writes from Pat's point of view, whether in the third person or the first, and which she chooses to use when significant. She completely convinces us that it is Pat's thoughts to which we are privy, though in the first person sections she makes no attempt to pastiche Highsmith's style. Highsmith's was spare, cool, relentless, with an overriding sense of dread; she spent little time on setting. Dawson's style is lyrical, particularly in her description, and immensely sympathetic to her complex, obsessive protagonist, as Pat becomes more and more unable to distinguish between what is real and what is in her head. As in Highsmith's novels, the 'murder' happens early in The Crime Writer; followed by reflection, guilt and the ghastly chain of repercussions, which culminate in another 'murder'. Some of this reflects the plot of A Suspension of Mercy, the novel Pat was writing at the time, set in Suffolk, about a man who fantasises about killing his wife, but Dawson has also used details from other Highsmith novels, in particular Strangers on a Train and Deep Water. Sam herself is modelled on the beautiful, sophisticated lover in The Price of Salt (filmed recently as Carol). The period detail is excellent: clothes, perfume, the items sold in the village store, the smell inside the phone box, the toiletries in Sam's bathroom, sixties' pubs. And of course the novel is about a writer and includes many insights into what goes on in a writer's mind. As Pat remarks to Ronnie, 'Who isn't to say that the life of the imagination isn't the most valid, the most real...' Something perhaps all writers have felt at times. The Crime Writer is published by Sceptre. Mary’s first book, a YA novel, was published in 1975. Since then she has written 120 books, mainly for children and teenagers but lately also a couple of adult novels under pseudonyms. After graduating in English Literature from Cambridge and spending a couple of years studying Linguistics at UCL, Mary wrote courses for the Open University for five years but then went freelance. 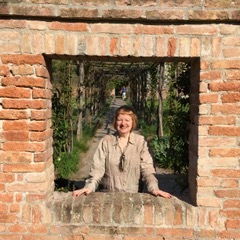 She recently started The Greystones Press, a small independent publishing house, with her husband. Mary’s books have been translated into 30 language and won some prizes. 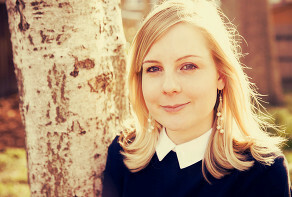 She runs the popular History Girls blog, which can be read every day. Mary lives in a converted barn in West Oxfordshire with her husband and three demanding Burmese cats. Her three daughters are all grown up: one is a writer, one a theatre producer and the youngest, a designer, is sailing round the world. Mary has four grandchildren and her latest picture book, Pirate Baby, is dedicated to the two on the boat. A new Anne Tyler novel is always a big event for me. I wait till it is available in paperback and when I saw this one in Oxford Waterstones, as I was buying my holiday stash, I snatched it up with joy. It was only when I opened it in Cornwall that I realised I hadn’t meant to buy this one. For it is part of the Hogarth Shakespeare project that invites top fiction writers to re-tell – or re-imagine rather – one of the plays as a novel. I really didn’t like the concept and, of all Shakespeare’s plays, The Taming of the Shrew is one of my least favourite, only just above Titus Andronicus. But, as the quotation from Good Housekeeping says on the back, “a new Anne Tyler book is always a treat,” so I set aside my reservations. 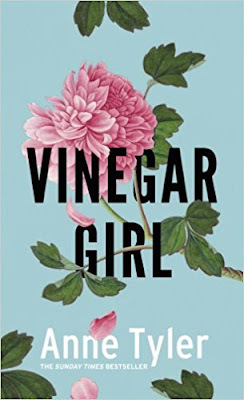 There is a typical Anne Tyler female protagonist. She is usually well into middle age or older, looking back on a life of devotion to a more or less grateful family when something jolts her into a re-evaluation of her life. It might be something as dramatic as a kidnap or as mundane as a walk along the beach but it leads to a major shift in outlook, a desire to do some things differently. And just as there is often a woman like this, somewhat faded and disappointed in life, there can instead be a male main character, who is finding life something he has to wrestle with. It can be because of bereavement like Aaron, the hero of The Beginner’s Goodbye, whose wife has been killed in freak accident or like Macon in The Accidental Tourist, whose young son has been murdered, though you don’t find that out till the end. Or he may just be someone who hasn’t quite got the hang of how things work for most people. Tyler males often seem eccentric and obsessive, hovering on the edge of the spectrum. So I wasn’t sure how frustrated young Katharina and Petruchio, with his exuberant and outlandish behaviour were going to fit into the Tyler mould. I needn’t have worried; she is more than ready for the challenge. It’s true that her Kate Battista has sleepwalked into finding herself the person who runs the house for her scientist father and ditsy, boy-mad fifteen-year-old sister Bunny. And into a job as a teaching assistant for four-year-olds in a nursery school. But she is only twenty-nine and not yet the faded and frazzled norm for a Tyler heroine. Her “Petruchio” is Pyotr, her father’s research assistant in his lab, whose three year visa is about to run out. Dr. Battista, whose speciaiism is autoimmunology, feels he is on the verge of a breakthrough that only Pyotr can help him realise. So he hits on the bright idea that his daughter Kate might marry him to get him his green card and enable their research to continue. Is it any wonder Kate is “a picky eater” and Bunny tries ineffectually to become a vegetarian? (Actually, this was something I didn’t like about the book: that Bunny’s vegetarianism is sneered at as a passing adolescent phase. I am so tired of novelists taking this line or the other one that we veggies secretly yearn for and scoff bacon butties when we can). Anyway, amazingly considering Pyotr’s disregard for social niceties and the pressure on Kate to provide him with a new immigration status, she does agree to a marriage blanc. Tyler doesn’t shirk the groom’s inappropriate wedding gear but it and his lateness are explained by a crisis at the lab: the experimental mice have been stolen by animal activists. She even has a heroic stab at Katharina’s “thy husband is thy lord, thy life, thy keeper” speech so beloved of would be female actors when auditioning for drama school. But this is not entirely successful – how could it be? “It’s hard being a man,” says Kate to her sister and the assembled company at the wedding reception her aunt has been allowed to give the happy couple, sounding like a mixture of Robert Webb and Matt Haig. But a touching epilogue told through the eyes of their six-year-old son shows them to have become just that – a happy couple. Only Kate has gone back to college and she and Pyotr have both won scientific prizes. The further away it got from Shakespeare, the more I liked it. Vinegar Girl is published by Vintage. Paul Magrs lives and writes in Manchester. 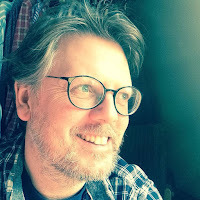 In a twenty-odd year writing career he has published novels in every genre from Literary to Gothic Mystery to Science Fiction for adults and young adults. His most recent books are The Martian Girl (Firefly Press), Fellowship of Ink (Snow Books) and The Christmas Box (Obverse Books.) Over the years he has contributed many times to the Doctor Who books and audio series. He has taught Creative Writing at both the University of East Anglia and Manchester Metropolitan University, and now writes full time. One of the reasons I love graphic novels is that they feel like someone has taken hold of a conventional novel and given it a bloody good shake. All the redundant words and phrases and padding and fluff and – especially – all the descriptions have simply fallen out. Leaving lots of lovely empty space. 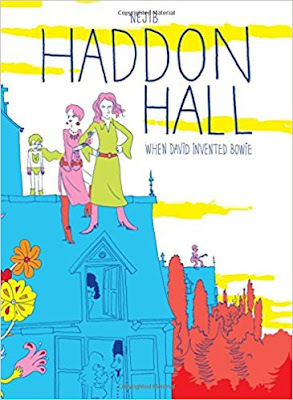 In ‘Haddon Hall’ – a fabular, fabulous account of David Bowie’s rise to fame as Ziggy Stardust by French-Tunisian artist, Nejib – there’s lots of that lovely space. The pages are organized less like a traditional comic strip than they are a child’s picture book of the era he’s conjuring. There’s just a touch of the Babapapa books created by Annette Tison and Talus Taylor in this tale of the strange menagerie that Bowie gathered about him in 1970. Both narratives tell of polymorphous and perverse other-worldly beings who live in heterogenous harmony inside a home perfectly attuned to their needs. The story goes like this: one-hit wonder David and his kooky American wife Angie find a dilapidated Victorian mansion in London where they can live out their fantasy of being bohemian aristocrats, throwing open their doors to other experimental souls. Guitarists, poets and cats come slinking through the massive, messy rooms and there are orgies and dinner parties and music festivals galore. It’s a utopian period that Bowie himself captures so brilliantly in those early records. It’s a strange thing: to have these sketchy, sometimes rudimentary figures evoking the time, place and even the music so beautifully. Dream sequences and drug hazes spiral off the page. Flashbacks drain the pages of colour, as we visit David’s youth and his brother’s first schizophrenic episode. Mostly, though, the pages are drenched in the gorgeous, hot pinks and oranges of a lost era. There are cameos from other icons: Marc Bolan wanders through, full of envy and ambition, pipping Bowie to the post when it comes to getting onto Top of the Pops. Lennon glides through the tale in his limousine, lecturing Bowie on the awfulness of pop fame and how it conflicts with art (‘Look, David. I was at dinner last night with Stockhausen and Nabokov…’) They sit together by the river and the world about them becomes scratchier and darker as Lennon explains how isolating stardom is. And then, when David gives sanctuary to his troubled brother, he also rescues the equally-doomed Syd Barrett, of Pink Floyd fame. As a Bowieologist I know pointed out – this never actually happened. But that doesn’t matter. It should have happened and this queer reimagining of the past installs poor Syd under David and Angie’s wings for a little while. Best of all, perhaps, is the fact that the whole story is narrated by the house itself. Haddon Hall has lain neglected for years and it talks to us directly of its delight when this strange young couple first came to look inside its doors. (‘I didn’t understand them, but already I loved them.’) The grand old nineteenth century pile has a final flourishing of life, thanks to the hippies and the glam rockers who come to make all kinds of music and love inside its walls. The curling, sprawling, art nouveau fronds and vines and petals that scroll through the pages like flowery doodles look just like exotic plants pushing their glorious way inside a derelict building. The most wonderful moment of all comes, perhaps, as David writes his opus, ‘Life on Mars?’ – and has his turning point – slaving over his upright piano, ignoring the stacked-up meals Angie brings him (‘You have to eat, sweetie…’), smoking endless cigarettes as he plonks away. It takes a whole page of repetitious images – a Warholian frieze of tinkering, tinkling Bowies - until he hits his perfect tune and the song finally comes together. Visually this is rendered as more of those wonderful, spiraling plants, emerging from the lid of his piano, blowing trumpeting, blaring colour back to the story. It’s a fantastic moment – and distils the creative process into one gorgeous double page spread. I’ve made it sound too straightforward and twee, perhaps. There are complications aplenty, and some wonderful moments of darkness. It’s a book about imagining your own kind of life and inventing it around you, but it’s cognisant of the pitfalls. Mad brother Terry is always there – pursued by the horrifying, phantom shapes of his affliction. Angie’s hopeless auditions and sheer lack of natural talent make our hearts go out to her, even as she tries her best to shine. Bowie himself is riven and eaten up with his desire to make a breakthrough both artistic and commercial. He almost despairs; he almost gives up. But he’s resilient and endlessly creative – and that’s what this book celebrates so fantastically. Even the frightening bits – the turbulent flights of fancy and the monochrome doldrums - are worth dragging yourself through. The book leaves him with a new hairdo (clip, clip clip: Angie chops his locks into a spiky, Heinz-red cut) and on the brink of massive fame. ‘On that day, David was finally avant-garde.’ It will also mean the breaking-up of the happy home, and already the commune’s members are going their own ways. Haddon Hall looks back on relinquishing its magical grip on its inhabitants and the story ends softly, and sweetly, with the narrator knowing that its best years are over, just as its friends’ are about to begin. The realization that your glory years can sometimes be quite short ones – ‘this enchanted interlude in my peaceful life as a house lasted for only two springs’ – is, I think, the most important part of this glittering tale. Joanna Rossiter grew up in Dorset and studied English at Cambridge University before working as a researcher in Parliament and as a copy writer. Virginia Woolf's seascapes, Thomas Hardy's Wessex, the moors of the Brontë sisters and the blitzed bombsites of Rose Macaulay have all informed her writing. She is particularly interested in the bonds between people and places. The Sea Change, her first novel, was picked by Richard & Judy as part of their 2013 summer book club and was also chosen as the 2014 Bath Literature Festival's Big Bath Read. She lives and writes in Oxfordshire with her husband and two children and is currently working on her second novel, set on the remotest island on earth. In one of the very first conversations between the two main characters of Lila, the old preacher remarks after talking about his past that "I suppose the next time I tell it, it will be a better story. Maybe a little less true. I might not tell it again. I hope I won't. You're right not to talk. It's a sort of higher honesty, I think. Once you start talking there's no telling what you'll say." As with all the best novelists, Robinson has an uncanny ability to distill the theme of her entire story into just a handful of sentences. Lila is a novel that is full of these miniature epiphanies - glimpses of the bigger picture in the book's small details. The light and water and wind that pervade Lila’s experiences of both nature and the towns she passes through are all imbued with symbolism: the river that Lila bathes in outside her drifter’s hut; the cracks of light coming in through the curtains of the St Louis whorehouse, the lanterns hanging in the trees of the revival meeting where Lila is selling apples as a girl. Always laced into these physical details is a sense of the spiritual - or at least an interrogation of their potential symbolism. Lila herself is constantly questioning the relationship between the physical world and the spiritual world and whether or not they overlap. Is there any room for the spiritual when life for Lila is simply a daily struggle to survive? This is a question that never really leaves her even after she is safe and warm with a roof over her head. Water and its ability to make her physically clean and quench her thirst is also the means of her baptism and spiritual rebirth. But this symbolism does not sit easily with Lila; she wrestles with its portent and what it means for her old way of life, which she looks upon with nostalgia as well as hopelessness. She refuses to let her life be reduced into a simple trajectory of sinner turned saint. 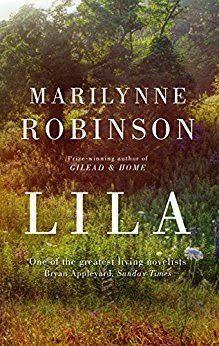 Lila is the third novel in Marilynne Robinson's critically acclaimed Gilead trilogy. It follows the story of an orphan drifter who is raised on the run by a woman called Doll and works in a St Louis whorehouse before arriving in the small town of Gilead and unexpectedly marrying the town's preacher. The concept of a fallen woman made good might appear trite in the hands of a novelist less skilled than Robinson. But, just as Lila's inner life, richly enjoyed by the reader, remains a mystery to the man she marries, the plot's air of simplicity soon gains depth as the novel progresses. Lila challenges many of her new husband's convictions about the nature of life and death and the notion of a spiritual journey where the old life is left behind for a new clean life. She prefers to see divine wonder and grace interwoven through each of her experiences from her childhood through to the story's present. This is reflected in Robinson's masterful handling of the narrative which weaves together memories from Lila's fraught past with her more comfortable present. The complexity of human goodness and divine grace is also reflected in the fact that the first person to show her unconditional love is not the preacher but Doll who takes her from a place where nobody answers her cries and raises her as her own child - to Lila there is arguably more divine love in this simple maternal act than all the small Christian kindnesses shown to her in Gilead, which seem contrived in comparison. Once again it is a physical act of love - that of a woman caring for a child - that provides the starting point for Lila's spiritual questions. Ames, her preacher husband, is happy to muse from the pulpit or on paper - he likes to write letters. But Lila's theology is altogether more physical and internal - rooted in the landscapes and objects around her and in the people she loves. Even her love of the preacher is conveyed more through physical objects than words: the smell of his woolen jumper which she takes to use as a pillow or his garden which she tends. Her constant conversational refrain of "that's a fact" seems to underline this connection to the physical. And yet Robinson also bestows it on Lila ironically: unlike the preacher, Lila's thought life is composed of questions rather than statements. Since she cannot find answers for even the most fundamental of questions about herself - her real name, the identity of her mother and father - she questions the nature of everything that follows. She experiences the world empirically, only ever asserting as fact the feelings most familiar to her: hunger, distrust, the cold. She is always reluctant to commit herself to words because that would involve revealing the inner life she has guarded so carefully over the years. The fact that Ames only ever knows his wife in part and it is only the reader who is privy to lila's thoughts perhaps tells us something about Robinson's own philosophy for the novel as a form: to reflect the loneliness of human experience - the fact that no one can ever truly know the thoughts of another, the constant divorce between thought and word, and how the novel can paradoxically in a small way remarry the two to act as windows into the souls of others. When Ames remarks that the more a story is told the less familiar it feels he is conveying something of this paradox: the novel as an artistic form gives the reader both the impression of closeness to its subjects and yet a sense of distance too - one is, after all, escaping the real world for a set of fictional characters removed from our own experience. For Robinson there seems to be a spiritual truth buried in all this: Lila wrestles with a God who, in spite of people's flawed attempts to make him known, remains mysterious - a God of questions as well as answers. Lila is published by Virago.